It would be easy to be skeptical of the Nokia N800. Tagged as an “Internet Tablet” it is neither a phone nor a computer. It’s too big for a phone and too small to be a tablet PC in the typical sense. It could be said that it’s trying to fit in the same space as the old Apple Newton or the Sharp Zaurus (In fact, there is even a Newton emulator called Einstein that runs on N800’s predecessor, the 770). As noted before, I was skeptical of the little N800 when I first layed my eyes on it, but it has suprised me. A few years ago, I had become fed up with lugging around a 10lb. laptop, and tried to turn a Sharp Zaurus into my nomadic computing device (more info here). Ultimately, this failed. The Zaurus was a pretty nifty little machine. Like the N800, it ran Linux. What eventually limited its practical utility was very simple: Browser compatibility, too many sites that didn’twork on the little screen or required features the Zaurus browser couldn’t handle. The ultimate jury is still out on the N800 as to whether it survives beyond the “it’s cool” honeymoon, but it certainly has passed the first trial exam. Right now, in our household, we often find ourselves asking whether to take the N800 along (it is known around here as “dad’s little computer”). I’m already noticing that it comes along a little less frequently than it did at first. but it’s still far more likely that we’d toss the N800 in the car than a regular laptop. While the N800 is obviously designed for portable and nomadic use, I have also used the N800 around the dinner table and while watching TV at home too, where it is a lot easier to grab the N800 than a full-sized laptop. I have not yet had the guts to forsake a real laptop on a business trip, but I’m pretty close to giving it a try and taking just the n800 with me instead. In my case, one thing that I needed to even consider this was a keyboard. 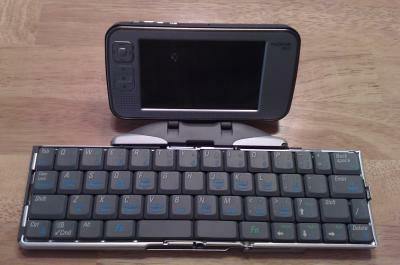 The N800 supports bluetooth keyboards, so I grabbed a Stowaway and it has worked great with the N800. You can see it in the photos below. 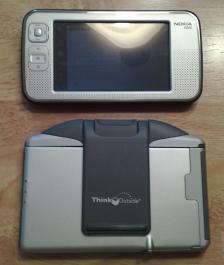 When folded, it’s not much bigger than the N800. When open, it’s a very usable keyboard. It’s still not quite like using a real full keyboard because it has fewer keys and so the way one has to produce numbers, punctuation, and other characters is using extra color-coded function keys (like additional shift keys). This can mess you up for touch typing. But it is much better for heavy text related work than the stylus or N800 “finger keyboard” (which I just don’t find useful at all – maybe it works for others). One of the reasons I’ve had to take a real laptop on all my recent business trips is because I’ve need to hook to a projector to make a presentation. There is no VGA output on the N800 and even if there were hardware for it, I’m not sure I’d have the guts to hope it would work when I needed it to give a presentation at a conference (on someone else’s projector). For the next business trip where I don’t expect to be presenting, I will try to go laptop-less and report back how it works out. One should note that the n800 is still to be considered “early-adopter” with all that goes with that, including an OS that is a bit fragile. One disadvantage of it being so open is that anybody can write code for it, and it can be hard to tell the compatibility or quality of a given bit of unofficial software. Crashes and lock-ups are not that hard to produce. My N800 has become important enough to me that I’m much more careful about loading software onto it than I was at first (I already had one lose its mind to the point I had to start all over). X-terminal crashes. I must be able to use ssh if this device is to be useful to me. Unfortunately, the X-terminal (console) application seems to be a bit buggy and can crash mid-vi. This seems ot happen less when using the Bluetooth external keyboard. Weird idle/sleep-mode lockups. Sometimes the N800 does not come out of sleep. It seems to depend on what apps were running when it went to sleep. The Gizmo VoIP app causes crashes on my N800, espcially mid-call. While only somewhat annoying, I consider it a BUG that when the screen goes dim, taps with the stylus still take action, so effectively you are punching in the dark. I have to remember a “dead area” on the screen that is safe to tap to bring the screen back so I can see it. When the screen is dark, the first tap, no matter where on the screen, should just bring the screen back, and not actually take any other action. I don’t want to make it sound like the above happen all the time. They are rare, and often just a minor annoyance. If they happen at the wrong time, they can be major pain, but in practice that has been rare. As much as I might like to think I’m some kind of a power-user, the fact is what I do most often on this box is web surfing. IM/Chat (AIM and IRC mostly in my case) perhaps comes next, or maybe it’s a rough tie between mail and ssh (used for remote access to mail and other things). So many apps and services can be accessed via the web nowadays, that the browser, and support for as many websites as possible, becomes the most important function of an Internet connected device. In this case, the N800 is pretty darned good. In my case, in additon to that, all of the apps mentioned above (mail, IM/chat, ssh) are must-have requirements too and if any of them fail, the box fails for me. The n800, combined with my mobile phone (for a data connection when there is no wi-fi), and the stowaway keyboard, finally looks like the portable device that can substutute for a laptop, at least in many situations – and it’s a lot easier to get through airport screening! I just got a N800, and for some business trips, it will satisfy the need (i.e email, web browsing). I’ve been pleased with the device, I do need to get a BT keyboard. It’s been easy to install from the various repositories. I used to tote around a Newton but stopped carrying it when they came out the with color one. I stopped carrying the Palm about 10 years ago, almost got a Zaurus a few years ago, but am glad I waited for the N800. Hey this is a great review. I have been using a N800 recently too. A couple of days back I turned on the handwriting functionality, which turned off the stylus based keyboard. Now I want to have that keyboard back and can’t seem to remember how to do that. Any ideas? Never mind. For some reason I was missing the ‘Input Method’ option under the menu.